Products that are no longer available to be ordered can be permanently deleted or archived. Any past purchase history will be retained in the contact's history. Take a backup first in the event you accidentally delete part numbers that you did not intend, you can restore it. Before deleting, we recommend that you print your current product listing to have as a future reference if needed. Select the first product to delete, from the product list tool bar click (or right-click and select Delete). Select the first product to delete. Hold the Shift key, then click on the last product in the range. From the product list toolbar click (or right-click and select Delete). 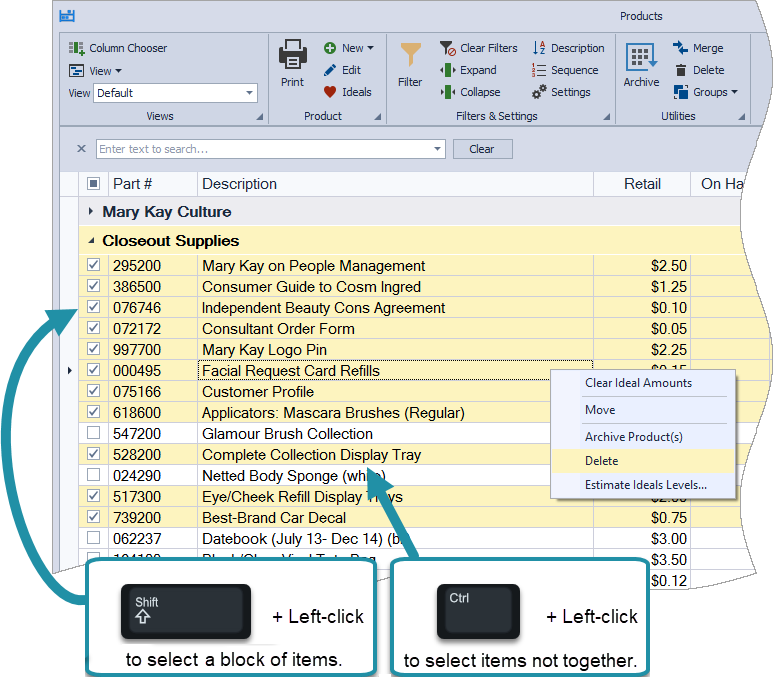 Hold the Ctrl key, then click on each product to be removed;from the product list tool bar click (or right-click and select Delete). For more information, see the Webinar: Products & Inventory.